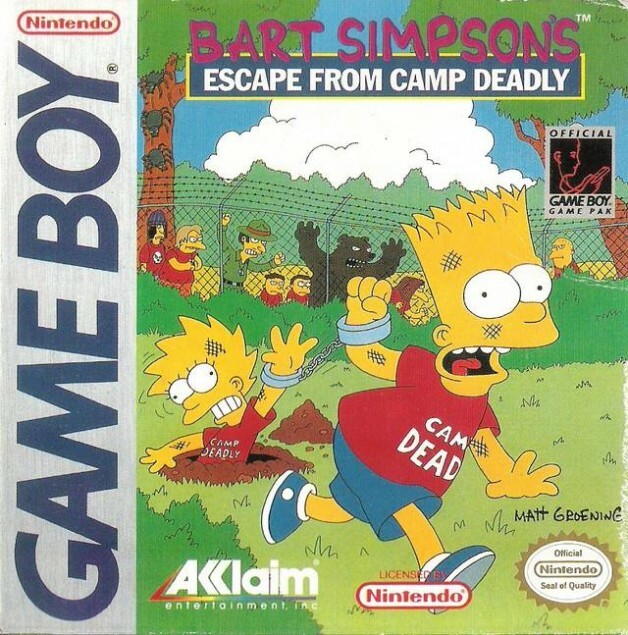 Bart Simpson's Escape from Camp Deadly is a platformer video game, released for the Game Boy in November 1991. It is the first non-LCD game to be released on a handheld console. The game's plot is similar to that of the episode "Kamp Krusty", an episode which aired 10 months after the game's release. Bart and Lisa go to a summer camp, with Lisa looking forward to doing nature walk tours and birdwatching tours, and Bart looking forward to the Fun and Games, along with campfire weenies. This is however Camp Deadly, which is run by a relative of Mr. Burns called Ironfist Burns. Ironfist wants all of the children there not to have fun. Having to deal with the camp for the time being, Bart then participates in the morning activity: Capture the Flag. Unfortunately, he has to capture the flags while every single member of the camp is against him (Ironfist Burns had rigged the rules to have Bart Simpson listed as Team A, and everyone else in Team B.). Lisa does help Bart in supplying him with Boomerangs in order to even out the battleground a small bit. He captures one flag until he reaches a river that he simply cannot cross, so he is forced to bypass it by climbing into a Treehouse. Unfortunately, the Treehouse also belongs to one of the Camp bullies, Blindside Bill. After defeating Bill, Bart manages to procure from Lisa a Beekeeper's uniform, which proved especially vital for the Second flag, posted directly behind a beehive. Afterwards, he stumbles upon Rebound Rodney's clubhouse and procures the Football Outfit, which helped substantially for Bart against his attackers: Swarms of campmates. In the first level Bart has to collect boomerangs from Lisa to help him defeat other camp members. After winning the Capture the Flag challenge, he heads over to the Mess tent for lunch. Unfortunately, several of the camp people want to kill Bart by throwing kitchen equipment, so Bart is forced to defend himself by throwing food despite it being against the rules (the food was not to his tastes, anyways, as the menu was Tofu Burgers, Broccoli, and Crabapples.). After managing to survive the Lunch hour, he then left for the Afternoon Activity: Capture the Flag. He also has to fend off against Killer Hornets, this time, in addition to being the odd one out. After capturing some Flags, he also stumbles upon a man hanging from a trap upside down: Madman Mort, Bart decides to free him. He then discovers a treehouse and fights Slipshod Sammy, after which Lisa supplies him with a Radiation Suit, which proved extremely helpful as Bart needed to travel in a Nuclear Pipe in order to cross an unpassable river. Before Bart could collect the final flag, Nelson decides to attack Bart. However, Mort arrives to keep Nelson pinned, allowing Bart to take him out with the Boomerang. After winning the second round of Capture the Flag, he arrives at the Mess Tent for dinner. He also has to endure yet another attempt at the campmates trying to kill him throughout dinner (This time, the Menu has Fried Smelts, Liver Pizza, and Prune Ice Cream.). After enduring Dinner, he discovers that they have a free exercise period, although they also forbade climbing Mt. Deadly as well as rock-climbing. Lisa and Bart rendezvous near a cabin, and Lisa admits that Bart was right about Camp Deadly being a horrible camp, and none of the things stated in the brochure never even existed in the camp and decide to escape Camp Deadly if possible. Bart then tells Lisa that they could scale Mt. Deadly as their best chance of escaping. Bart then makes a night time escape from the camp. Unfortunately, Ironfist Burns was lurking behind the bushes and learned of their plan. After traversing the treacherous path of Mt. Deadly, including dealing with boulder throwers, weak cliffs, Bald Eagles, Bats, and skeletons, Bart manages to arrive at the outskirts of Camp Deadly at night. He then discovers that a power station powering the camp is nearby, and gets the idea to shut down the power, thus shutting down the camp for good. He manages to evade personnel of the power station, as well as fires, hornets, and sleeping Bears. However, while traversing an underground passage accessible by a nuclear pipe, he discovers Lisa chained up by Ironfist Burns. Bart then decides to try and outsmart Ironfist Burns by shutting down all of the electric switches in the area. The sudden darkness allows Lisa to escape from her chains, as well as Bart to evade Ironfist completely. Upon emerging from the tunnel, Bart discovers the generator, and shuts it down, causing a blackout at the camp. As a result, the camp is shut down, and the Simpsons family poses near the now closed camp. Modified on March 22, 2014, at 19:18.